Today the pond was alive with the sound of music well frogs croaking and the spawn count has gone from one batch to four. I counted over 15 frogs either singles or mating pairs. It goes to show how important a small urban pond is for the wild life from the bees drinking in it , birds bathing in it hoverflies laying their young , ok mosquitoes I could do without . My bees were busy collecting water to take back to the hive today, and they were making use of my pond. They use the water to dissolve the honey which has set in the comb amongst other things. You can see its hairy eye which is one of the ID features it is the only bee to have hairy eyes. 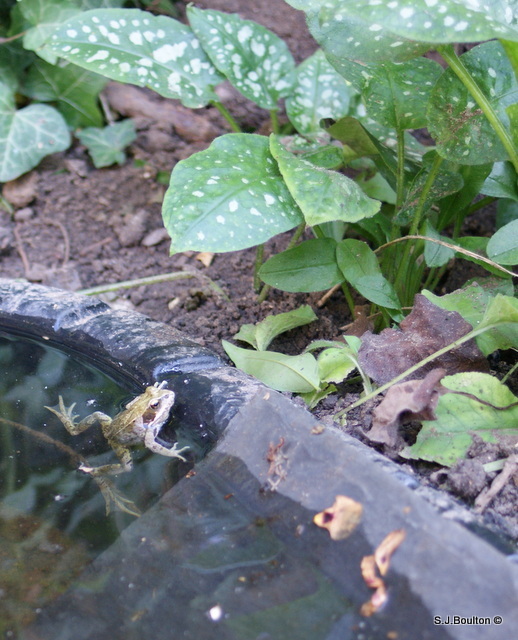 Plenty of frogs and tadpoles still in the pond. Since a lady gave me some plants , irises , sort of grass, pond marigold and some floating weed the pond is so clear and life it seems far more natural. 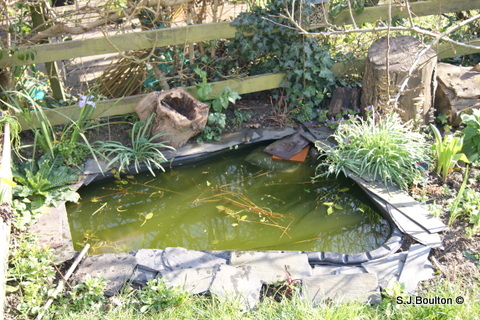 I am excited that my pond now has two lots of frog spawn and still has at least two more mating pairs of common frogs. 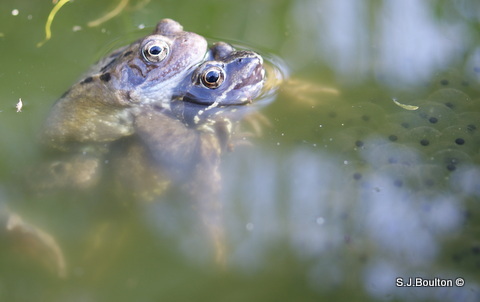 Common frogs Mating in the pond . The first lot of frog spawn but looks like there is more on the way. 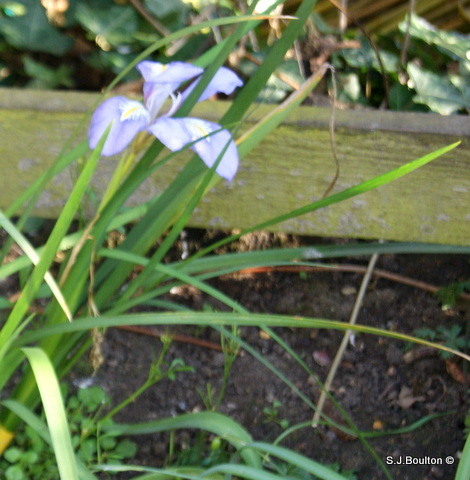 One of the Iris’s I planted is flowering. Around the pond and the garden is in need of attention now the warmer weather is here. 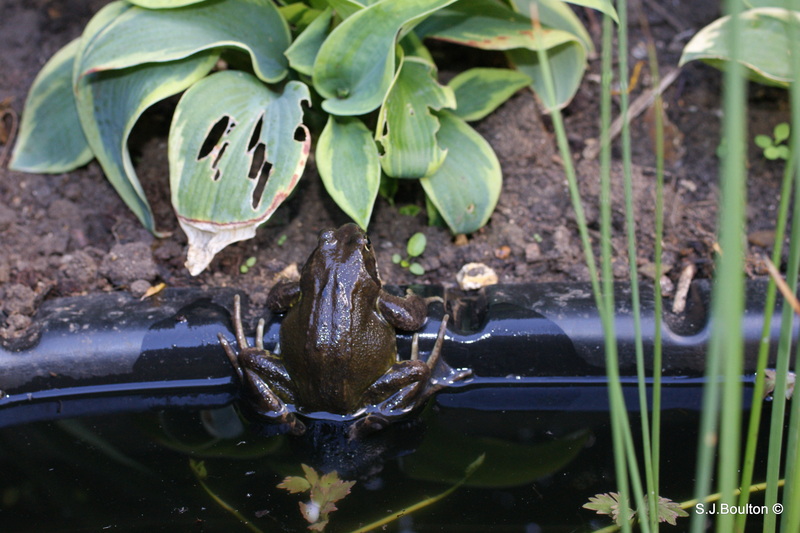 Common frogs have smooth skin that varies in colour from grey, olive green and yellow to brown. They have irregular dark blotches, a dark stripe around their eyes and eardrum, and dark bars on their legs. They are able to lighten or darken their skin to match their surroundings. This species is widespread in mainland Britain. 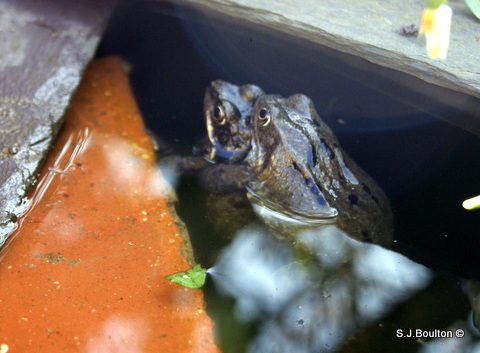 Common frogs are most active at night, and hibernate during the winter in pond mud or under piles of rotting leaves, logs or stones. They can breathe through their skin as well as their lungs. In spring males croak to attract females. 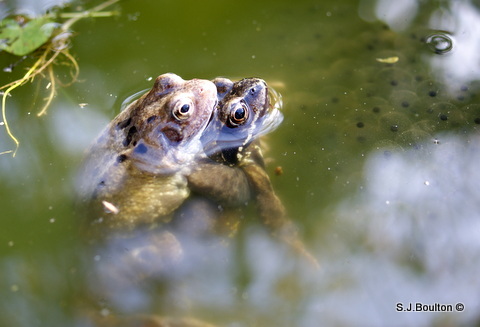 The male embraces a female and fertilises her eggs as she lays them in shallow, still water – frogspawn is a familiar sight. 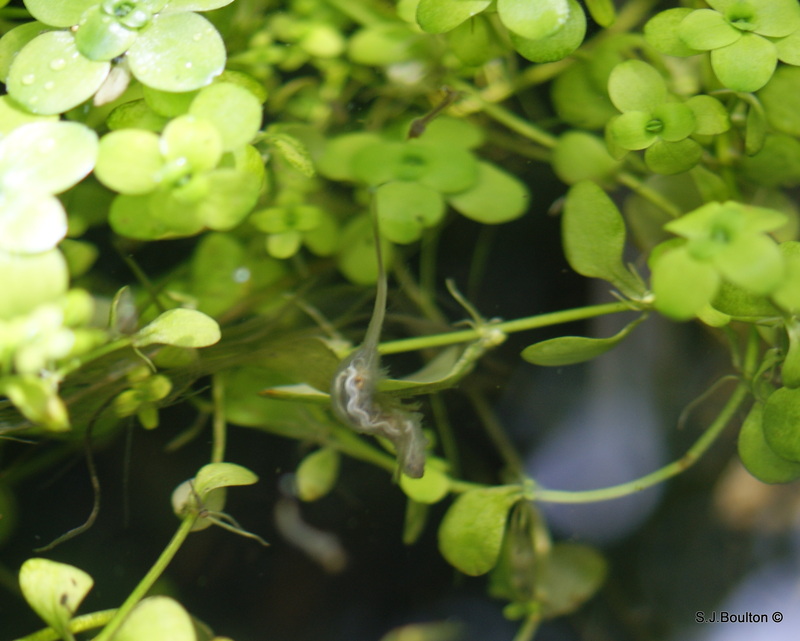 Tadpoles hatch, and over about 14 weeks gradually change into froglets: a process known as metamorphosis. Adults eat insects that they catch with their long, sticky tongue, snails, slugs and worms. 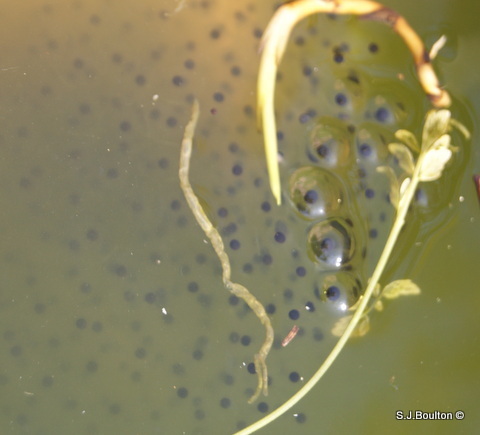 Young tadpoles feed on algae, but then become carnivorous. By the pond, in the meadow area and sometime the woodland area. Also by lakes, canals, meadows and woodland.